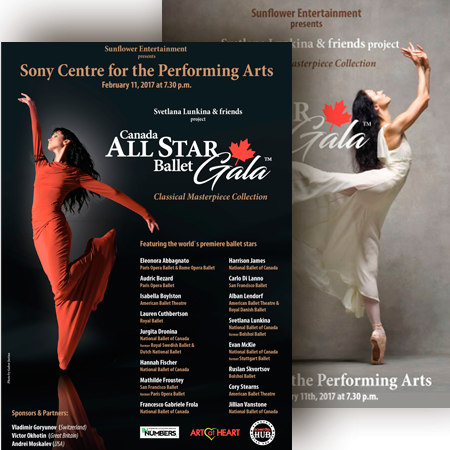 CANADA ALL STAR BALLET GALA of February 11 2017 is dedicated to the masterpieces of classical choreography with the special focus on 5 ballet’s signature styles — French, Danish, Russian, English, and North American. All of these styles presented as the part of the Gala Program by the participating dancers that keep alive these particular centuries-old ballet traditions. The Program provides an enlightening overview of classic 19th and 20th century ballet through selections from masterpieces that defined the art form. We offer Canada’s ballet aficionados a rare glimpse into the treasure trove of exquisite choreography that continues to dazzle audiences world-wide.